I love Tindie, it's like Etsy, but for DIY electronics. I have found so many useful breakout boards, fun kits and interesting gadgets to tinker around with. I kept on seeing the Maker's Box (Tindie store) kits trending on the main page. Finally I have purchased three fantastic looking kits and at first glance I love seeing the OSHPark Purple PCBs. 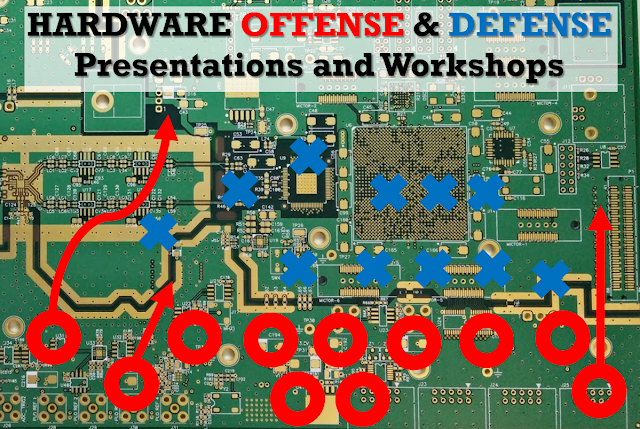 Yes these kits are completely open hardware and you can view them in shared projects and order your own PCBs to replicate or improve the kits. 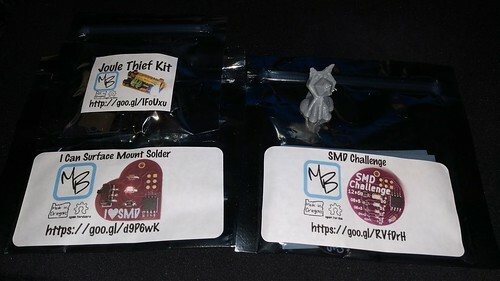 I purchased the Joule Thief, I Can Surface Mount Solder, and the SMD Challenge kit, which I will primarily be focusing on in this post. 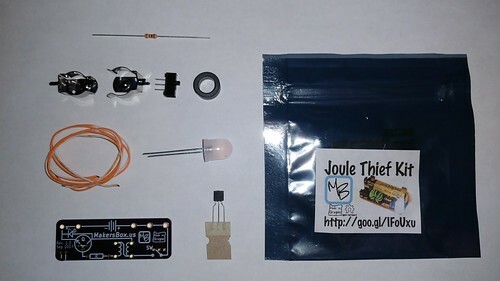 The Easy Joule Thief Soldering Kit, is primarily a through-hole soldering kit targeted toward beginners. 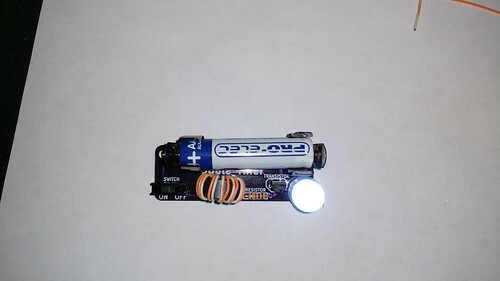 For those of you who don't know what a Joule Thief circuit is, it is a clever and simple circuit that can light a LED with a nearly dead battery. This kit has a really nice Instructables guide. In my opinion this kit is pretty high quality and for only $5, it is quite a great value! 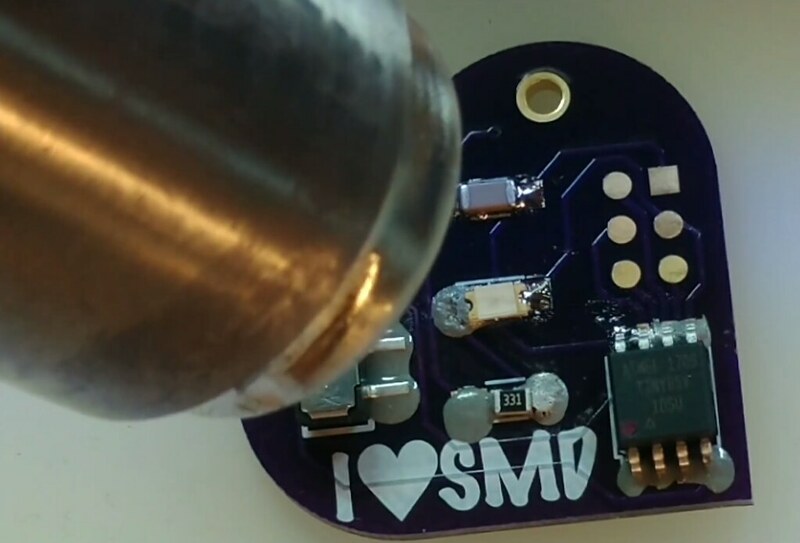 This kit is meant to be a gentle introduction for beginners to surface mount soldering. In the kit you get to solder a surface mount LED, Resistor, Capacitor, Switch, Battery holder, and microcontroller! I used solder paste and my hot air to reflow the components. 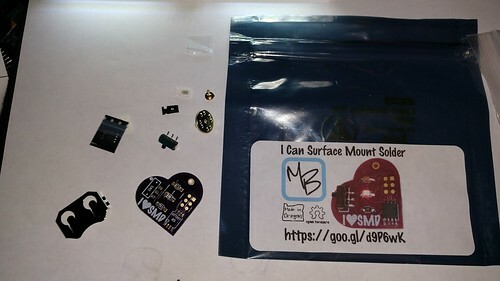 I originally intended to only purchase the SMD Challenge, because I really wanted to solder the challenging 0201 package components. On a daily basis I work with parts that are 0402 in size and above, and usually use a X10 microscope. At home I don't have the convenience of microscope, and I decided to assemble this at home to prove my worth and literally wear this bragging rights badge (Yes this kit is a badge that you can pin on your clothes). I could solder the 0402 to 1206 packages by hand with my Hakko FX-888D, but I have solder paste and a hot air rework station! Component placement of the 0201 was quite tedious and I had to keep on checking that I had the LED in the right polarity. I was even more worried about the hot air blowing the 0201 components off the board... Fortunately the only issue was that there was a solder bridge (short) on one of the ATTINY pins, but this was easily fixed with some flux and a quick dab of the iron to take some of the excess solder between the two pins. Making sure that none of the LEDs have fried from the hot air and that there are no shorts underneath the SMD components. WOW IT ACTUALLY WORKS!!!!! I just soldered a component the size of a sugar grain, without a microscope! Maker's Box makes quality and inexpensive soldering kits for beginners to experts. Definitely worth purchasing one of their kits to practice with and have fun. I was very satisfied with the SMD challenge kit and getting to solder the 0201 resistor and LED. 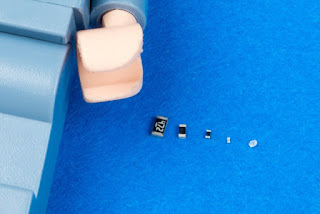 I also think it is very fitting that with the two SMD kits that you can literally wear them as a badge of honor.